Land has been one of the most uniting and dividing facets of human existence since our conception - and it continues to be the impetus for an abundance of the world’s hate and oppression. The desire and need to control our planet’s most valuable resource continues to spur injustices as old as war and as contemporary as the displacement of native populations from their neighborhoods. While there is an endless number of examples that can illustrate the negative ramifications of land control, the American Civil War is a prime microcosm of its power and ability to impact how people exist during that period and moving forward. Stemming from a dispute over the national government’s ability to prohibit slavery, the largest and most destructive conflict of the 19th century added an additional layer to the egregious foundations of America. The Confederacy, despite losing the war in 1865, cemented white supremacy as the seams of America’s fraudulent fabric. In addition to Confederate ideals’ fastening within the American psyche, public spaces would be dedicated across the country to this army and its leaders less than a year after their defeat - and these spaces would go on to be used as pawns to promote white supremacy as recently as 2014, particularly during periods of African-American resistance such as the Jim Crow and the Civil Rights eras. Many of these monuments were essentially erected as victory statues and this is a war that is just beginning to cease. 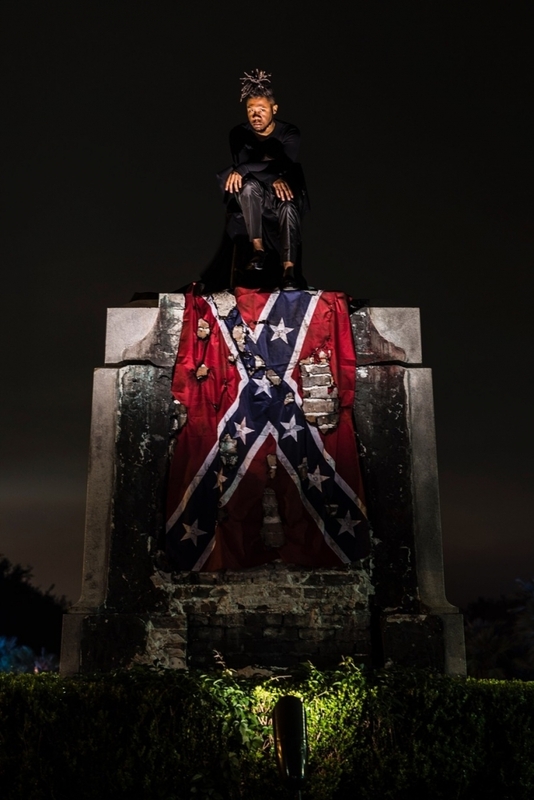 Following the June 2015 murder of nine African-Americans in Charleston, South Carolina by terrorist Dylann Roof, the Southern Poverty Law Center (SPLC) conducted a study to catalog and map Confederate iconography throughout America. Their study identified a total of 1,503. - 10 U.S. military bases named for Confederates. While opponents of these name changes and monument removals often use the “erasing of history” as a main component of their argument, historians refute this by referencing the periods during which many of these monuments were erected. That white supremacist future is as explicit as ever with today’s political and social climate - and as always, art is in prime position to shift the paradigm. In 1861, Pierre Gustave Toutant-Beauregard, commonly referred to as P.G.T. Beauregard, would become the first prominent General of the Confederate Army. This distinction would come as a result of him leading the Confederate Army to victory in the first major battle of the Civil War - The First Battle of Bull Run (referred to by the Confederate Army as the Battle of First Manassas). Due to confusion that was experienced on the battlefield with some officers between the American and Confederate flags, Beauregard believed it to be imperative that the Confederacy establish a more distinctive ensign moving forward - and the result would be what is recognized today as the Confederate flag. This red banner with the blue St. Andrew’s cross would become, and still exist as, one of the world’s most literal manifestations of white supremacy. 54 years after his victory, a statue commemorating Beauregard would be unveiled in my hometown of New Orleans and exist for another 100 years until the City Council voted 6-1 to remove it and three other Confederate monuments. It would take nearly two years for its actual removal and it, along with the other empty monument locations, now remain as empty and highly controversial public spaces. As noted, the piece above was a collaboration with artist Ti-Rock Moore and was a time-based iteration of an earlier piece entitled Gazing from her debut solo exhibition, “A Burning House.” Gazing was a live and modern interpretation of Auguste Rodin’s The Thinker and challenged viewers to question the Eurocentric foundations of our thought patterns. Despite the premise and aims of the piece being undisputedly righteous, Ti (as I affectionately call her) and her work are often berated. Ti is a gay white woman - and the majority of those who admonish her and her work have a problem with the latter two-thirds of that identification. As a white woman, most people have an issue with her creating work from the “black perspective” and my belief is that much of this criticism comes from a deep place of distrust among African-Americans. This distrust, which is a product of nearly 400 years of mistreatment, is extremely valid. And no one can argue with questioning the motives of individuals that come from a group of people who continue to consciously and subconsciously oppress others. However, there is a point when certain questions and critiques can perpetuate the actual problems, resulting in distrust that is solely impeding the progress of the collective consciousness. Criticizing Ti-Rock’s usage of my “black body” in Gazing is admissible, but also upholds the deeply rooted pillars of capitalism and white supremacy in this country - the very pillars that the overwhelming majority of these critics seek to destroy. An attack on my body being “used by a white artist” is stripping away the agency that I have over my body and my decisions - which only supports the mental and physical debilitation of people that white supremacists seek to promote. Yes - the themes that are addressed in her work are those that have been traditionally associated with the “black experience.” But as so many have said, including United States Senator Cory Booker, “African-American history is American history; the black experience is the American experience.” With that truth, it is thus invalid and destructive to shame someone from the “other side” for using their talents and abilities to critique the transgressions of their peers and ancestors. Additionally, to restrict the thoughts of anyone negates the true essence of humanity - and particularly the purpose of art. I will have the opportunity to perform Gazing at this year’s Art Basel, but I’m certain it will not be nearly as transformational of an experience as my time during Ti-Rock’s “A Burning House.” I was atop this 9-foot plinth for three hours per day during the exhibition period (July 26-August 26) - and in addition to being an extremely introspective and meditative experience, it was exceedingly educational. This month as a “piece of art” enabled me to discover new layers of purpose within myself, while also doing the same with Ti’s portfolio of work. Great art has the ability to ignite discussions and questions among the viewer - and I had the privilege to watch this occur in real time on a daily basis. The spectrum of viewers who were moved by me and the other works within the exhibition was so wide. Ti often acknowledges the fact that her work is targeted toward white people [in contemporary art spaces] who rarely discuss the topics addressed in her work. And while this population was certainly the most common to visit the exhibition, there was another group that was much more important to the future of contemporary art. Contemporary art has unfortunately existed as an extremely elitist field since the beginning of the 20th century and its spaces continue to be monolithic and dominated by whites. This is a dynamic that must change if art is going to ever truly fulfill its boundless and humanistic mission. One of my most moving moments atop the plinth occurred on only my second day with a woman named Ms. Terry - a meter maid whose area included the Julia Street Arts District where Jonathan Ferrara Gallery exists. Due to my placement in the gallery, I, along with Ti’s ArtPrize-winning Flint, was the most viewable piece from the street. Watching the reactions as people passed by confused about whether or not I was a real person was definitely one of the more amusing experiences of my life. After one day and a half in the gallery, I had already been able to get an adequate gauge on how people would enter and engage with the exhibition. I was particularly captivated by the manner in which some people, especially black people, were struck by 1) the sight of a water fountain and font-style that is deeply ingrained into the psyche of every [African-] American and 2) a black man(nequin) sitting atop a pedestal. While some allowed these visuals to lure them into the gallery, others took a few seconds to inquire and admire from afar and then moved on. Too often, the latter were African-Americans. With the traditionally exclusionary vibration of contemporary art spaces, it is quite understandable why certain people, particularly African-Americans, would not feel as inclined to walk into them. When Ms. Terry opened the gallery door toward the end of my second day to express her shock at my ability to breathe, her posture and demeanor clearly portrayed a lack of comfort and belonging. Noticing her curious indecisiveness, I invited her inside and suggested that she take a look around the exhibition. After entering the gallery, she walked to every piece, engaging intently with each. As she passed me to exit she was nearly in tears. “It (the exhibit) taught me so much I didn’t know; I learned so much,” she said. “I love everything about you. You’re so beautiful,” she added. Ms. Terry and people like her are an integral part of contemporary art’s future. She was able to resonate with artwork in a space that has excluded her for over a century. Her tears and expression of my beauty were simply the manifestation of seeing herself in me and the rest of the artwork in the exhibition. Anything that has the ability to trigger the thoughts and emotions of someone like Ms. Terry, while simultaneously doing the same for a privileged white person, has perpetual purpose. And to allow an illusory construct, that was created to legitimize slavery, inhibit our ability to acknowledge the power in a feat such as this would be a true disservice to our humanity. The common thread between Gazing and New Wars. New Stories. New Heroes. is the reimagining of our past, present and future. While Gazing addresses this from the way European-centered thought has impacted how we think and exist, New Wars. New Stories. New Heroes does the same but particularly in regards to public spaces that have been used to promote white supremacy since 1865. Fear and greed have been unfortunate catalysts for certain populations to intentionally and unintentionally oppress others who do not share their phenotypic characteristics. Whether as “serious” as the criminal justice system or as “superfluous” as the contemporary art world, racism and white supremacy are foundational across the entire spectrum. As one of the most fluid fields of human endeavor, art has the ability to address these issues from one of the most unrestricted lenses. However, to be able to do this effectively, the art world will have to first reconstruct its own oppressive canvas. A world can no longer exist where people like Ms. Terry do not feel comfortable enough to enter contemporary art spaces; or where only 5 of the 120 artists participating in the world’s original biennale are African-American; or where women (and no non-white artists) represent less than 4% of the modern art collection in one of the top museums in the world. As the frontline of humanity’s war against itself, art has and must continue to exist as the most courageous troop. To create is to self-medicate - and racism and white supremacy are millennium-old afflictions whose antidotes will require extremely creative conception. This development begins with the art world’s assessment of itself in an effort to truly fulfill its functions, while also bridging the gaps between itself and “the rest of the world.” But thankfully, we have the ability to utilize the planet’s most valuable resource to ignite the revolution.